Drivers: Darrin Treloar; Passengers: Sam Harrison, Simon Cohrs. Family Connections: Mark Plaisted, Andrew Plaisted. World Championship: First 2008, Other Appearances 2006. World Super Cup: First 2002, 2003, 2004; Other Best Results: First Kings Lynn 2002, 2003, Workington 2002, Coventry 2002, Isle of White 2002, 2003, 2004, Tonbridge 2004, Somerset 2004, Second Tonbridge 2003. Australian Speedway Championship: First 2006, 2007, 2008, 2015, Second 2009, 2011, Third 2002, 2010. Australian Speedway Grand-Prix: Third 2014/15. New Zealand Speedway Championship: Second 2010. New South Wales Sidecar Speedway Champion: 2001/02, 2003/04, 2004/05, 2005/06, 2006/07, 2007/08, 2009/10, 2010/11. Queensland Sidecar Speedway Champion: 2010/11. 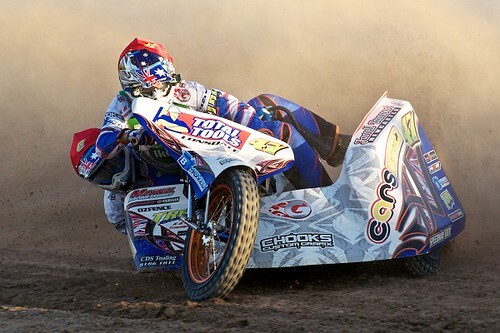 South Australia Sidecar Speedway Champion: 2001/02, 2004/05, 2006/07, 2007/08, 2008/09. Victoria Sidecar Speedway Champion: 2007/08, 2009/10. Worcester Winner: First 2003, Second 2002.